Scooters are definitely the in thing, in fact I’m not sure they will be ever be ‘out’! When I walk Athena to preschool she scoots, as do at least half her class, they leave their scooters lined up ready and waiting for them to finish and scoot home again. We also have a lot of parents walk past us after dropping their kids off at the primary school near by, most of whom are carrying empty scooters, and some even riding adult sized scooters themselves! So we’ve put together a Mini Micro Scooters review. Ever since Athena learnt to scoot her scooter as been a permanent fixture on days out and trips to the shops. It keeps her happy and she gets less tired than walking everywhere too, but means she’s still getting more exercise than if she was sat in the buggy. In fact her scooting so much was one of the main reasons we sold our double buggy as she just wasn’t using it! Of course now that Arlo is bigger he wants in on the scooter action, and now after months of watching his sister hurtle ahead of him, coast round corners and (eventually) learn to use her brake to stop he has the chance to catch up with her! To enable younger kids to join in with scooting Micro Scooters have come up with two clever types of scooter, the Mini2Go and the Mini Micro 3-in-1 and they sent us both so we could put them through their paces and explain the difference in the two models.. I’ve made a video of Arlo learning to scoot which shows the difference in the models too. Mini2Go is suitable from 18 months to 5 years, and consists of a sturdy plastic seat with a built in storage compartment, which opens from the back and enables you to store a few nappies, wipes and a coat or perhaps your purse and keys for a quick spin round the park! The unit has little foot rests, which would work brilliantly with the ScooTow bar or Scoot n Pull strap (which are sold separately) but we found that as Arlo had seen his sister use her scooter and had also used other ride on toys at playgroup he knew what to do with his feet and didn’t really use the foot rests much! 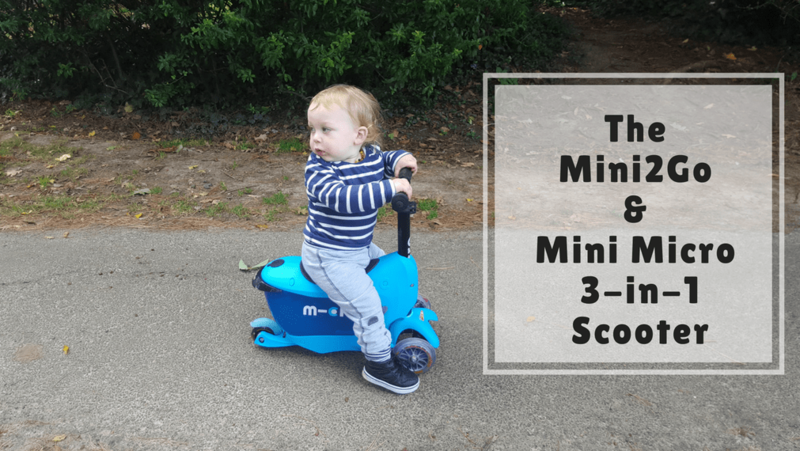 I found that the Mini2Go was slightly sturdier than the 3-in-1 because it’s heavier with the seat unit attached (and obviously heavier still with things in the storage compartment) but that the smooth running wheels meant Arlo could get going on grass or a path with no problems! 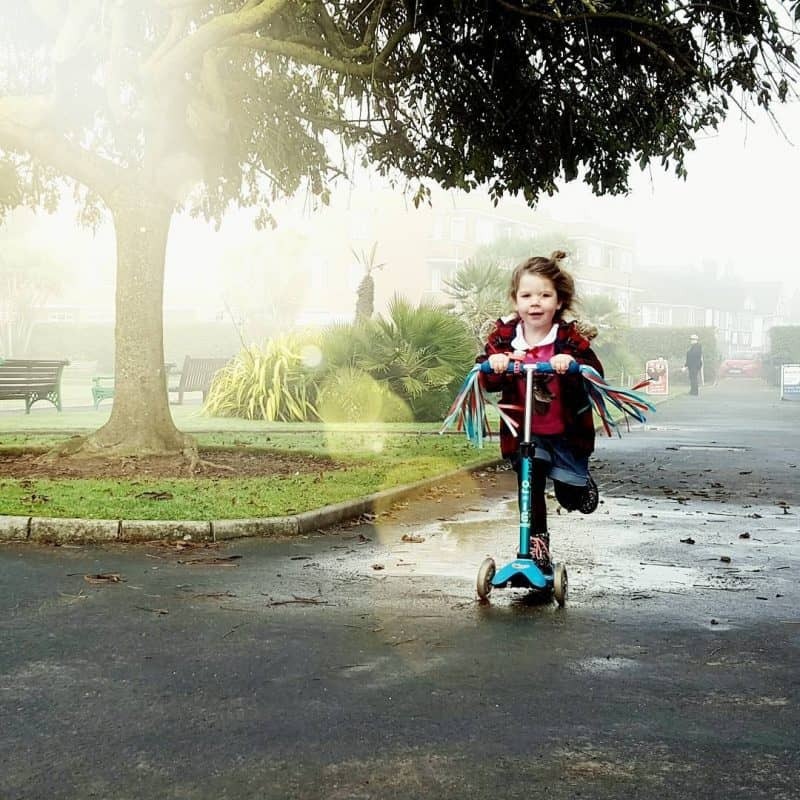 Once your child has got a bit bigger and wants to start scooting without the seat you can easily remove it with the allen key and they’re left with a scooter with an adjustable height handlebar (no allen key required) that should see them up to the age of around 5! It has two wheels at the front and one at the back so is sturdy and doesn’t require them to balance on two wheels yet. Steering is easy (once they’ve learnt and requires very little effort, unlike a bike! 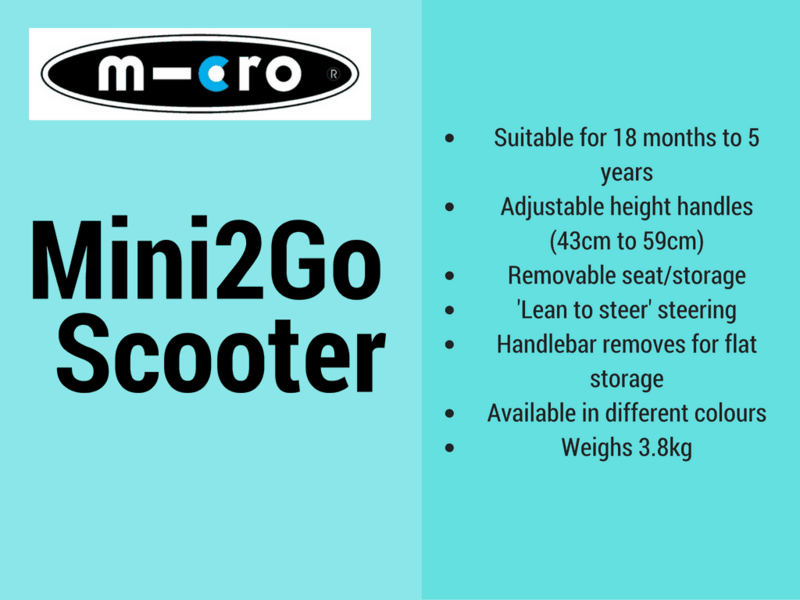 The Mini2Go range is available in blue pink and red with a whole heap of accessories too! The 3-in-1 Deluxe scooter comes with two handlebars and a seat unit. The seat is more lightweight and narrower than the Mini2Go, and obviously has no storage option. It’s slightly padded and there are two height options to use as your child grows. 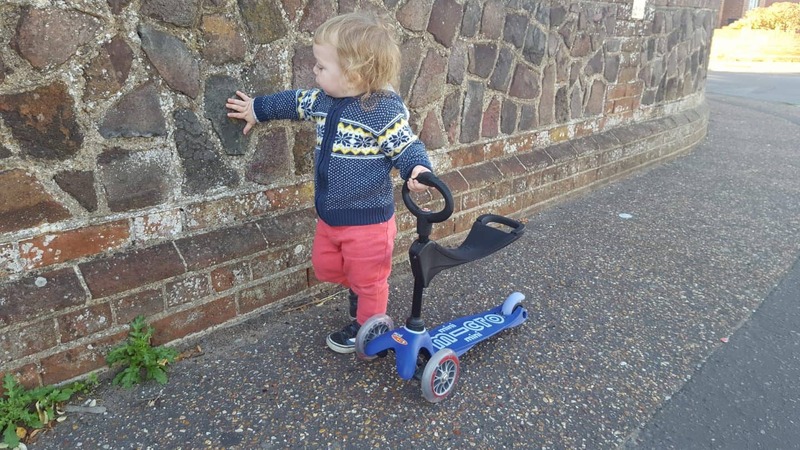 The ‘O’ shaped handlebar is perfect for the first few months as it means your child isn’t accidentally putting pressure on one side of the regular handlebars, and therefore steering off to the side when they don’t want to! I think if we had had this style handlebar for Athena when she was learning it would have made life a lot easier! You can use the O shaped handle without the seat too once they’ve graduated to scooting without the seat, and then once they’ve got that done out comes the height adjustable T shaped handlebar and away they go! 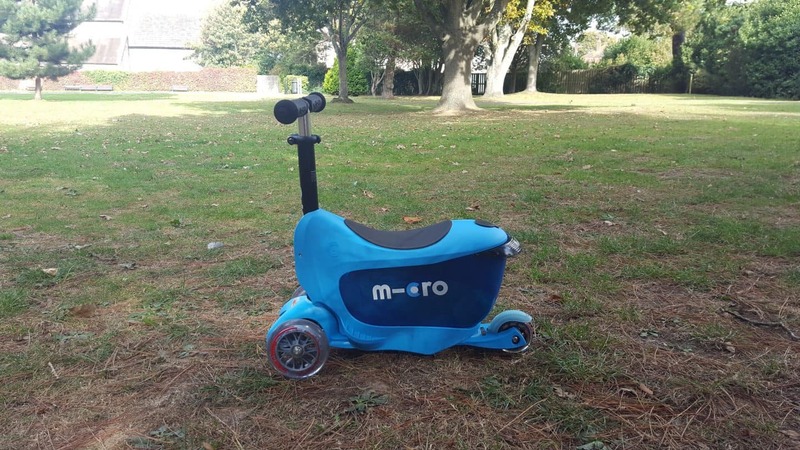 The Deluxe version of the scooter has an increased weight limit and a rubber raised grip on the deck which means it’s great to use in wet weather as less likelihood of slipping. 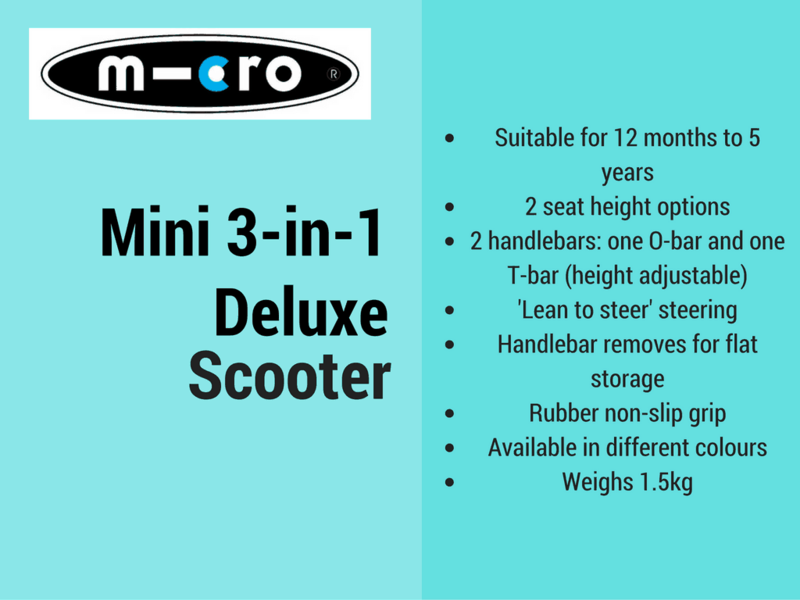 This model is also available in four colour options, although if you wanted to pick from the wider colour range of mini-micro scooters (or even design your own!) you could buy the seat and O bar separately. Micro Scooters sell a huge range of accessories to spruce up their scooters, Athena has been sporting multicoloured ribbons, a bell and sometimes a water bottle and holder too (though she loves this so much she takes it into preschool for her daily water bottle as it has owls on it!) As well as these accessories there are baskets, bags, ponchos, wheel covers and lots more! Don’t do too much at once, not only is it frustrating when you try to learn a new skill but it’s also quite psychical especially for a child who normally gets pushed or carried around! So don’t expect too much at once! Teach them to use the brake only after they’ve mastered scooting quite well, we kept trying to teach Athena to early and the act of having to use one foot to put behind her on the brake kept making her wobble. Now though she uses it like a pro! Arlo doesn’t go fast enough to need it yet so we’re holding off explaining how, although I expect he will watch and learn from Athena eventually! Mini Micro scooters really have made our life a lot easier, everyone’s happier with a scooter to ride on now, and as my husband has his long board when we head to the beach I often get left behind as I’m the only one with no wheels! Tempted to ask for an adult scooter for my birthday actually so I can catch up! I often see people on facebook groups saying ‘oh but they’re a bit expensive aren’t they?’ when they ask for suggestions of brands to try/toys to get their kid for their birthday and yes, they are more expensive than some, but having bought a cheaper version before we bought Athena hers I can hands down say they’re worth every extra penny! To view the full range of scooters for kids and adults take a look at the Variety of Micro Scooters and follow them on facebook for the latest news and competitions! We were provided with two scooters in order to write this review, all words and opinions are my own. This post contains affiliate links. i like the idea of the seat, so younger ones can started with them. I know what you mean about everyone using them, though – I don’t think anyone doesn’t arrive at my son’s school without a scooter! Oh I like the sound of this especially the seat as it would be suitable for my son who is 23 months. I like that it will last a while since it goes for up to 5 years. That looks ace! I love that it can last them so long rather than having to buy another every year! Definitely one of the benefits! This looks great! My daughter is 2 and has just taken a interest to scooters. I bought my now four year old a scooter one or two years ago. He still doesn’t have the balance to scoot on it. I think I’ll have to get him a different one because this is one of the ones where you have to groove and the wheels don’t move left or right. Great info if your trying to choose, I like the idea of the little seat for the toddlers if they get tired legs. P3 received one of these from her grandparents for her birthday. She loves it but is still getting to grips with it I think. I really like the O shaped handle bar… it’s such a great idea. And great teaching tips!